In today’s Gospel, (Matthew 2:13-23) we read that King Herod sent his soldiers to kill all the boys in Bethlehem under two years of age, in order to eliminate Jesus whom the wise men had told him was the Messiah. In the church these children are called the Holy Innocents and are considered to be the first Christian martyrs, although of course, they did not actually know Jesus. Nonetheless, this points to the fact that those who are associated with Christ who are His followers have often suffered torture and death. We know that many thousands of Christians die as martyrs every year and more are tortured, imprisoned or thrown out of their homes. Nevertheless, this seems a little distant from us because we live in a country where religious freedom is protected by law. However, the original meaning of the Greek word “martyr” is simply witness, so any one who witnesses to Christ is technically a martyr. However in the days of the early church, as now, in many places to bear witness to Christ meant one died. The Roman Empire was actually very tolerant. One could practice the religion one chose to. All one had to do in order to be tolerated was to burn a piece of incense and say “Caesar is Lord”. Then one was free to believe and practice any religion one wanted. But this would not do for the early Christians, as for us “Jesus is Lord” and no one else. We as Christians are called upon to bear witness to our faith. This may not get us imprisoned or killed, but we may be the subject of laughter, derision or even hostility, because of course, in our society there are people who dislike Christians or who think them foolish for believing in God. But bearing witness to Christ doesn’t only involve saying that one believes in Him, although it may very well involve this. We have to put our faith into practice through acts of love and forgiveness. In the early days of the church even hostile Roman citizens would say about the Christians “see how they love one another.” Therefore by peacefully confessing our faith in the one true God and his Son Jesus Christ and striving to lead, with God’s help, lives of charity and forgiveness, we are bearing witness to Christ. This entry was posted in Church Services, Sermons on December 26, 2014 by gldstrm. On December 24, the eve of the Feast of the Nativity of Our Lord, the Church commemorates Saint Eugenia of Rome. Born in 280, she belonged to a noble pagan family. Though Roman by birth, she lived in Alexandria, Egypt, where her father Philip had been sent by the emperor to govern. Philip not only worshipped pagan gods, but strongly opposed Christianity. Like many highborn Romans, he distrusted this new religion that seemed to exalt the humble and weak. Rome had built its empire on brute power and conquest—ideals very different from those the itinerant preacher from Palestine taught. The preacher’s teachings were spreading far and wide, and Philip worried that they threatened traditional Roman society. The account of Eugenia’s life tells us that she discovered Jesus Christ by reading the words of Saint Paul. How thrilled she must have been by the stirring description of Him in one of this day’s readings, Hebrews 1: 1-3: “God, who at various times and in various ways spoke in time past to the fathers by the prophets, has in these last days spoken to us by His Son, whom He has appointed heir of all things, through whom also He made the worlds; who being the brightness of His glory and the express image of His person, and upholding all things by the word of His power, when He had by Himself purged our sins, sat down at the right hand of the Majesty on high…” Eugenia was determined to follow this wonderful Lord who so loved human beings that He had “by Himself purged our sins.” She fled her home, accompaied by two male servants. They accompanied her to a place far enough away that she could escape being found out. Nearby was a men’s monastery. Eugenia looked at it with a mixture of joy and sadness; joy because it was a place where her newly-discovered God was truly worshipped, and sadness because, as a woman, she could not join that worship. But she was a resourceful, courageous woman, and so she decided to disguise herself as a man and apply to enter the monastery. Her servants hesitated to help her—cutting her hair, and putting together loose-fitting garments—but she convinced them, and in her disguise she approached the abbot. Abbot Helenon saw at once that this delicate-featured person was not a man, even though she lowered the pitch of her voice. But he didn’t turn her away, or reproach her. Seeing her sincere spiritual desire, he gave her an isolated cell, where she would spend many years in monastic effort. 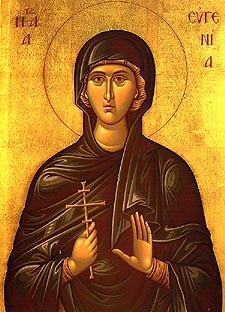 Saint Eugenia saw the wonder of Christ in her own life. She was given the gift of healing, and had the joy of converting her adamantly-pagan father to the faith. Both Philip and Eugenia were ultimately martyred. Like the shepherds who “made widely known the saying which was told them concerning this Child” (Luke 2: 17a) they had bravely spread the Gospel, and unflinchingly faced His enemies, who killed their bodies but not their souls. This entry was posted in Education, Sunday to Sunday with DCE on December 22, 2014 by gldstrm. A philosophical system is somewhat independent of the philosopher who founded it. In other words, even if we don’t know much about Plato or Aristotle, or if what we know about them is mistaken, this does not affect the content of their teaching. In other words, the teaching of Plato or Aristotle can be evaluated on its own merits regardless of the details of their lives. This is not true of Christianity. Christianity is a deeply historical religion. Christianity does not simply assert abstract moral or theological principles but is rooted in God’s action, in human history, culminating in the coming of his son Jesus Christ. This is shown in the Gospel and Epistle for this Sunday, the Sunday before the Nativity of Christ. Today’s Gospel, which comprises the first chapter of St. Matthew’s Gospel is the genealogy of Jesus Christ. Today’s Epistle is most of chapter eleven of the epistle to the Hebrews. This chapter goes beyond a simple list of names and tells of the circumstances of the ancestors of Christ. Both of these readings show that the coming of Jesus Christ was prepared for during and by the history of the Jewish people. The coming of Jesus Christ is the culmination of this process. Jesus Christ is God made present in humanity. So true Christianity cannot be separated from this history and these people. Christ is with us in Holy Communion which is truly His the Body and Blood. What all of this means ultimately is that in the rushing and business of the Christmas season and the end of the year let us pause for a few moments from time to time and realize that wherever we are or in what circumstance we find ourselves in the person of Jesus Christ, God is with us, as the choir will sing at the Christmas Vigil. This entry was posted in Church Services, Sermons on December 20, 2014 by gldstrm. There is a cold country in the far north covered with deep forests and snow most of the year. 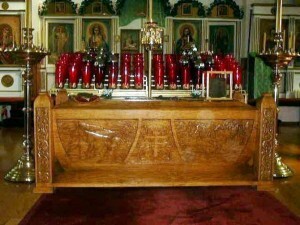 The people there have been Orthodox for centuries, and Orthodoxy has become an integral part of their culture. These words could apply to several countries, but here they refer to parts of Alaska. From the 18th century to 1867 Alaska was part of the Russian empire prior to its sale to the United Sates. Alaska became a center of the fur trade. One of the Orthodox saints of Alaska was St. Herman, canonized in 1970, the first Orthodox saint to be canonized in North America. 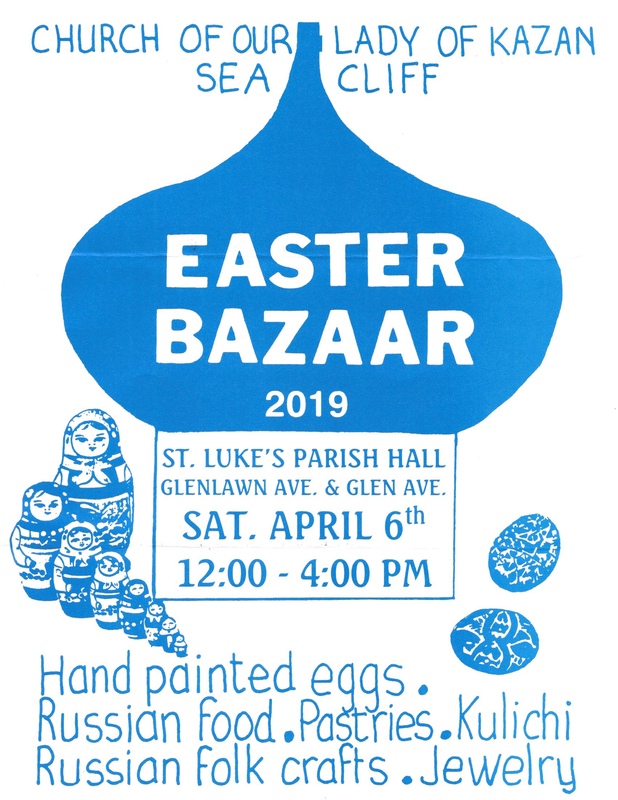 St. Herman was a monk of Valaam monastery, one of a group of missionaries from that monastery who came as missionaries to Kodiak Alaska in 1794, invited by the Russian American Company to preach the Gospel to the Alaskan natives. When the missionaries got there, the found that the natives were in various ways being treated badly by the Company and St. Herman and other missionaries defended the natives from such mistreatment. 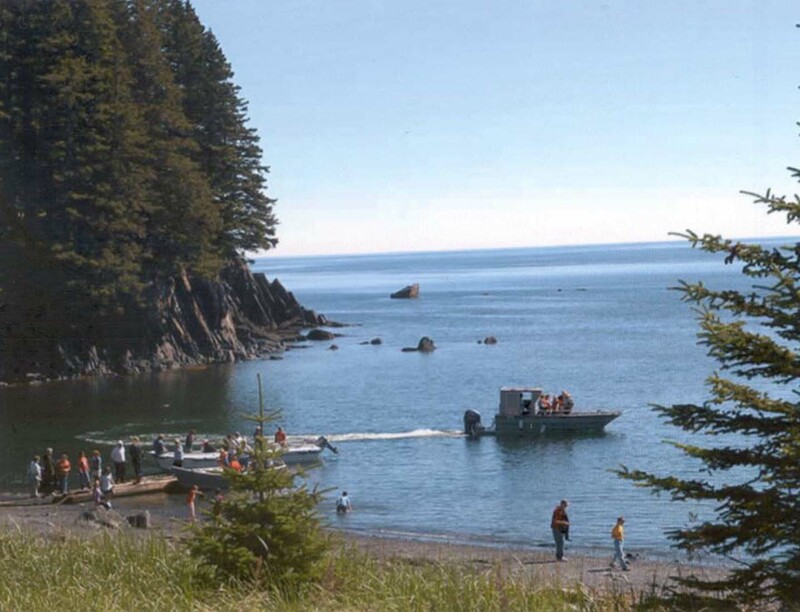 Within several years of their arrival the monks baptized as many as 7000 Alaskans. St. Herman never became a priest, but became head of the mission in 1807. He ran the mission schools, which taught religious subjects as well as agriculture. 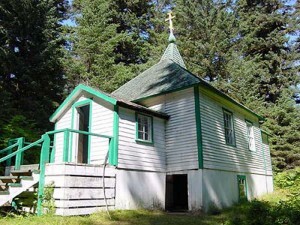 Although St. Herman loved the members of his flock, he longed for the solitude of a hermit’s life, and in 1811 moved to Spruce Island, about a mile from Kodiak. He lived a strictly ascetic life, but many of the natives came to him, especially on Sundays and feast days. His hermitage soon had a chapel, a guest house and a school. In addition to preaching the Gospel and teaching secular subjects, St. Herman took care of many of the natives during an epidemic. 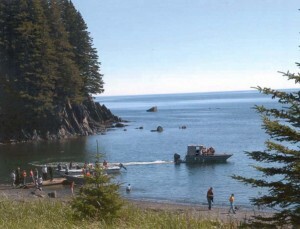 St. Herman was deeply loved by the native Alaskans and they still think of him as their “Apa” or grandfather. Tradition holds that the people on Kodiak Island knew the moment of St. Herman’s death because they saw a pillar of light emanating from his hut on Spruce Island into the sky. The example of St. Herman, like that of other great missionaries of the Orthodox Church, show how one can transmit all the traditions of Orthodoxy while respecting the positive aspects of the pre-Christian culture. St. Herman was a tireless missionary and was known as a miracle worker. He was canonized in 1970 and his relics lie in the cathedral in Kodiak. 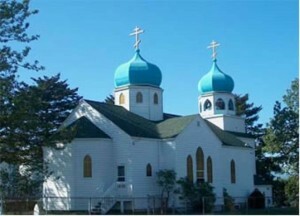 The cathedral in Kodiak, as well as the site of his hermitage on Spruce Island, are places of pilgrimage for Orthodox people from all over the world. Venerable Wonder-worker Herman pray to God for us! This entry was posted in Commemorations, Events on December 12, 2014 by gldstrm. On December 9 we celebrate “Righteous Saint Anna’s Conception of the Mother of God.” This lengthy, explicit title offers some important insights into Orthodox theology. First, it tells us that Mary the Mother of God was conceived through the union of two human parents, like any other person born in the world. 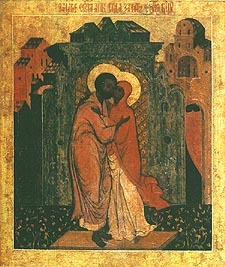 Many icons of her conception clearly show her parents, Joachim and Anna, standing together in a loving embrace, with a bed behind or near them. It is noteworthy that the day before this feast is, in the Western Church, the feast day of the Immaculate Conception. This refers to the way Mary (not Jesus Christ) was conceived. The Roman Catholic teaching is that God intervened at the moment of Mary’s conception to remove the stain of original sin, which is transmitted by the act of human reproduction. This stain marks us all from the day we are born. So, since God removed that stain from Mary, she is different from every other human being. Father Thomas Hopko, in his book “The Winter Pascha,” writes that Orthodoxy does not go along with this teaching because our Church does not believe that such a stain exists. Father Thomas writes that all of us, including the Theotokos, “are born into a fallen, death-bound, demon-riddled world…We are all born mortal and tending toward sin. But we are not born guilty of any personal sin, certainly not one allegedly committed “in Adam.” The title of the Feast also tells us that the baby girl Anna conceived was indeed the one who would become the God-bearer, or Theotokos. God honors the act of human reproduction by using it to bring forth the woman who will have the most exalted privilege of any human being who ever lived. Not only that, but He leaves her free to say “no” to His plan for her if she so chooses. We honor Mary’s agreement to God’s plan because it is basic to our salvation. That she is born into the world the same way we are, with no special intervention by God, means that she can be a truly human example of holiness, one that we are able to follow. Another mother is remembered by the Church on this day—Hannah, the mother of Samuel. Like Anna, she had to wait a very long time to have a child. During those years of waiting, she was “broken-hearted and wept and did not eat” (I Samuel/I Kingdoms 1: 7). Joachim and Anna suffered too. Joachim was humiliated by being turned away from the Temple as he attempted to offer his sacrifice; being a childless man he was not considered worthy to do so. This entry was posted in Education, Sunday to Sunday with DCE on December 5, 2014 by gldstrm.